First off, welcome to all my new blog followers! I’ve never been “freshly pressed” before, so it’s been quite an adventure. I hope this post doesn’t disappoint! This year, for me, is a year full of extensive and intense research travel. This summer, my research is taking me to a new state, across the country from where I currently reside. This means that I have to move, both me and my cat, across the country. Initially I was going to fly, but after some good advice and a lot of thinking, I decided that I wasn’t living somewhere where the public transportation was good enough for me to easily get food and take the cat to the vet without a car, so instead of flying, my cat and I will be driving over 2500 miles to our new (temporary) home. This is a stressful trip for anyone, but add in a sweet, but nervous cat in poor health, and you have quite a challenge. For those of you who are new, my cat, M, is incredibly sweet – here’s some posts about him. We’ve hung out in the car together while it isn’t moving, letting him sniff around and explore all the nooks and crannies. He decided his favorite place was the drivers seat – look out, if you see a wildly driven car in Texas this summer, it might be M at the wheel (just kidding). 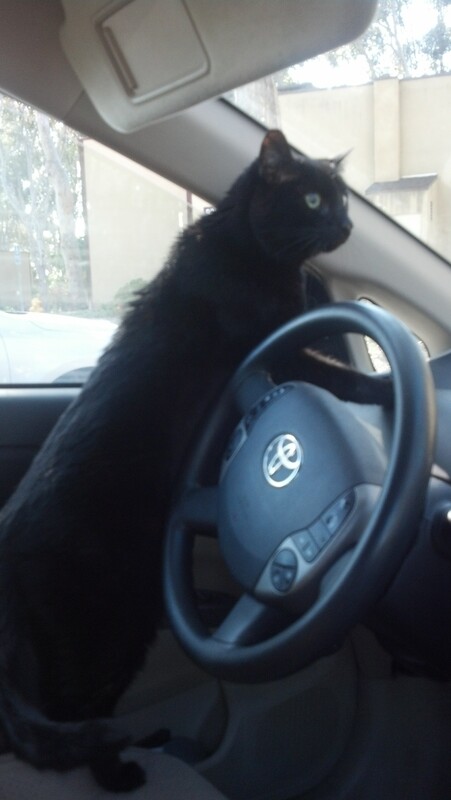 We practiced short drives with him in the carrier, and then longer drives with him allowed to roam free. He actually seems to prefer to be in his carrier most of the time. We’ve even driven randomly and ended up in places he’s unfamiliar with. In addition to practicing driving, I’ve been collecting all of his favorite things – his favorite toys, blankets, food, etc. to have with us, so he doesn’t feel quite so lost. I think M will have more luggage then me when we make this drive! But it seems to be working, and I think we’ll have a successful drive. Positive thoughts are most welcome, though! I’ve known how to break this down and figure out what he needs because I know what makes me comfortable and uncomfortable. I know that for me, going new places is terrifying, but I know how to break it into small, manageable steps. I know it helps me, and I thought it might help M cope with the drive. So far, it really seems to be working, since he’s gotten much more comfortable in the car and really actually seems to enjoy it now. If it didn’t, I’d try another tactic. Author’s note: I’ve been working on this for months trying to get it right. It’s not quite right yet, but I think it’s time to let it fly free. I see it every day. I read it from people I respect and whose opinions I cherish. Well-meaning people who care deeply about people in my communities. I hear it from commercials, mass media, and even simply random strangers. Sometimes it’s directed at me, and sometimes its directed at someone else, either present, or not. It’s a qualification. A statement. A description. Someone is described as “beautiful”. Most of the time, it’s meant as a compliment. A statement of how good that person is. How wonderful they are. Sometimes, it’s a statement about a person’s looks. But much of the time, it’s neither. It’s a qualification. Oh, my beautiful autistic friend. Her beautiful son with down syndrome. His beautiful daughter who has cerebral palsy. As if being beautiful is the only quality that makes this person worth acknowledging. I read a blog post a while ago, by a mother of twins (a boy and a girl). She told a story about a visit to Santa, something many young kids anticipate quite a lot. The boy was asked what his favorite subject was in school. The girl? Santa told her she was pretty. On the surface, things like this seem harmless. The problem, is that repeated over and over, it teaches people that their brains are not important. It’s what’s on the outside that matters. People who are far more eloquent and educated in this subject than I am have written great articles about how harmful telling little girls that they are “pretty” or “beautiful” can be to them as they grow older (example here). The important thing is being able to take pride in yourself, *inside* and out. Being “beautiful” is not an antidote to being “less”. This is where I start to see a problem. I am going to talk more specifically about the autism community, because that is what I know best, but I have seen this in nearly every other disability community forum that I have ever looked into. I see “my beautiful autistic friend” written out over and over and over again. All you really need is “my autistic friend” if you’re trying to make a point directly related to autism. All you actually need is “my friend” most of the time. Beauty has nothing to do with it. When autism positivity groups compile pictures of awesome autistic people, or blog posts about the good parts of life, the most common adjective used to describe an autistic person is beautiful. As if we’re objects to be admired from afar and that “beauty” is our only redeeming quality, rather than anything else about us. Even other autistic advocates use it to describe each other. But by using the word in the context of “autistic (but) beautiful”, we are continuing to undermine our own humanity, reducing ourselves to something that only holds value by our looks. I am not a particularly “beautiful” person by any standard. I am fairly petite, and do not have many of the typical features considered “beautiful” by society. Mostly, this is because I don’t care to conform to that. I choose comfort and practicality. My life is lived by creating and employing coping mechanisms for interacting with the world, and I am 100% OK with that. For me, that is my power and my choice, and I am confident in myself and comfortable with how I look. However, I (and many other disabled adults like me), and not a “beauty”. When someone calls me “beautiful”, it feels like a kick in the stomach, because I know that the word is not there due to physical beauty. It’s there to attempt to compensate for something else. To compensate for my “other-ness”. As if “beauty” makes me more of a whole person. There are a lot of positive, powerful adjectives that I can use to describe myself. Things like “passionate”, “friendly”, “kind”, “curious”, or “intelligent”. I might, on occasion, “write beautiful prose” or “wear a beautiful dress” or even have a “beautiful personality” (hah!). But “beautiful” on its own, is not a word I use to describe myself, because, honestly, I’m not, and it’s not something I want to be. By constantly qualifying statements about disabled people with comments about their “beauty”, we’re putting undue pressure on a population to feel self-worth based how we look. We know we often look different. Why not value us for who we are, instead? Just as society is finally learning to treat young girls as whole people and not just “beautiful” little objects to be admired, I’d like to challenge members of the disability community (disabled people, friends, family, and colleagues) to do the same. We, disabled people of all ages, are so much more than “beautiful”. We are “clever”, “confident”, “creative”, “funny”, “caring”, and many, many, many other adjectives. Some of us truly are beautiful. Some of us are not. Some of us fall somewhere in between. We are people, and deserve to be treated and spoken about as such, without qualifications. If you have to use an adjective (and please consider whether you even need one in the first place), pick one that highlights what you like best about that person. I’m willing to bet it isn’t their “smashing good looks” that has made them valuable to you. Language is incredibly powerful. While I appreciate being valued for my qualities, I don’t need to be qualified to be valued as a person. So please, don’t call me “beautiful”. I read a neat post by SeventhVoice today positing that one characteristic that all autistic women seem to share is this innate feeling of being “different” from everyone around them. I have to say, I related quite a bit to this. As an autistic person (heck, as a person), I’ve never really felt “in sync” with the people around me. I’ve always been just a bit (or a lot) different. That feeling of difference sometimes gets less, sometimes it increases, but it never really goes away. 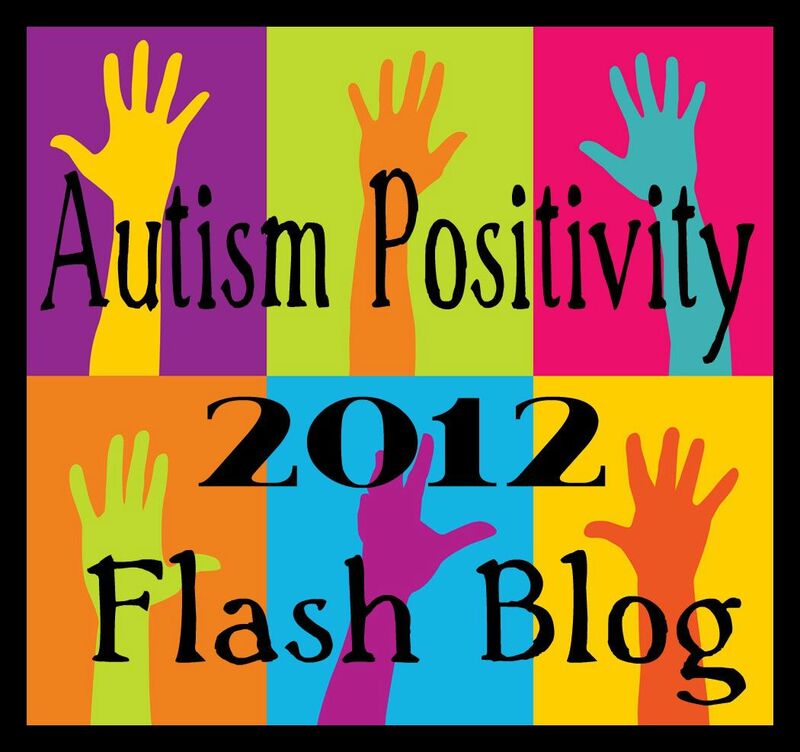 When I was first discovering that I was autistic, I felt that “different” feeling beginning to lift. I thought that I’d finally found “my people”. I read thousands of blog posts, dozens of books and personal narratives, describing experiences of being autistic, and it was like reading a story from my life. I’d never felt that sort of connection with anyone before, and I was fascinated. I knew that this was where I belonged. But the more that I read, the more I realized how different from most of these people I really was, not in vocation, but in ultimate goals. The more I became part of the autism online community, the more blogs I read, the more people I met, the more different I felt from most of the autistic online community. I’m a young woman. I’m 25 now, and I started blogging nearly 3 years ago, at 22. During that time, I’ve had the pleasure of interacting with dozens of other young autistic women. They write compellingly, about important topics. But I’m not like them. I’m not an activist. I don’t feel compelled to write posts spewing rhetoric, to preach about politics and right and wrong. I don’t take offense and pounce when someone uses the wrong word around me (though sometimes I will take someone aside after and talk to them). My existence and worth isn’t defined from one crisis to another, trying to find a “them” to go up against. I’m not saying that my “peer group” is doing anything wrong. I simply don’t have that sort of disposition to be a part of them, and therefore, I’m different from them. I don’t feel community with older autistic women either – they’ve lived so much more life than I have, and our experiences don’t match up. I don’t have children (though not all of the older autistic women do either), and I’ve been incredibly lucky in my life to not have ever been sexually abused, homeless, or really unemployed (thus far). My experiences in life just don’t match up with those of other autistic women, and so I feel very different from that too. Plus, I’m just a lot younger, I haven’t really lived life yet. And it’s not just the autism community online. When I was an undergraduate, I spent a good portion of my time with the LGBT community at my university. At first, we bonded over having “always felt a bit different” from everyone else. But then they found their “same” and I was left on the outside, still different. When I was in high school, I joined science team, to be with the people who also felt a bit different. They found their same, and I was still just different. Even in graduate school, my colleagues have found their “same” and I’m still on the outskirts. I’ve hung out with theater people for much of my life, self-proclaimed “weirdos” – and even there, I’m the weird one among the weird. I think in some ways, I just don’t know how to feel that “same” feeling. I think this is part of my existence, perhaps even attributable to my being autistic all my life. I’ve never found a real community that I didn’t feel that I was still different from. Even communities of people who have always felt different don’t have room for me. Sometimes I wonder if the problem is me. That I just have no idea how to be a part of the “we”, and that I’ll never fit in. That maybe I go looking for differences because that’s what is comfortable, that is what I know. I know I’m different, so even among people who know they’re different, I’ll always find a way to stick out, to stay separate. In a sense, though, that’s what makes me who I am. I go about living my life, interacting with the world, knowing that I’m different from everyone I interact with. That means we’ll have different opinions, different wants, needs, desires. And that also means that by accepting that I have my own (different) set of needs, I also accept that someone else’s needs are different from mine, and that is ok. In a lot of ways, I think that autistic people in particular can fall into this “different” trap. We have trouble with change, and we’ve been different all our lives. What happens when we find people who are the same? We different-ize them, because we can’t handle the idea that there are people with whom we have some sameness. In a lot of ways, this is what is wrong with the greater autism community. There’s always an “us” and a “them”. It doesn’t matter really, who the players are. Sometimes it’s men versus women. Sometimes it’s older Autistics versus younger Autistics. Sometimes it’s parents versus autistics. Sometimes it’s autistics against the charities and anyone who happens to support them. We seem to spend an inordinate amount of effort focusing on how we are all different. We look for differences because that’s all we know how to do. And we assume that unless someone is exactly the same as us, that they are 100% evil. I can think of very few people who are genuinely 100% evil. That’s not the point. Really, most people are generally good. They might not have the background or the knowledgebase that I have or that someone else has, in order to make a decision the same way I would. But that doesn’t make them evil. It means that we have less common ground. It means that we might have to work harder, dig a little deeper, to find where we agree. A big part of the autistic existence is feeling different from those around us. I know I’ll always be just a bit different. In a way, it is very isolating. But in another way, it means that I know myself. I know what I need to be me. In accepting that I am almost always different from those around me, I have also recognized that I often have some “same” as well, even if that “same” is only a very tiny portion. I go about life with the assumption that difference is ok, and that the best thing I can do is to interact with kindness and the best intentions I can, hoping to find that tiny bit of “same”, the common ground, to foster communication and understanding. And if that makes me different, then I am happy to be. When I started this blog, the idea was to document how my brain worked, to think about how I thought about, interacted with, and perceived the world. I was working through my discovery of what Autism was and the fact that I was autistic. I wanted to share my newfound understanding with others who might benefit from reading about a different perspective of the world. I’ve always sort of understood that I thought differently from everyone else. I figured, since I obviously didn’t think like everyone else, that no one else did, exactly, either. To me, this was a logical conclusion. If I was different, then everyone else was too. And if that was the case, then they all had interesting thoughts and stories to tell about how they interacted with the world. This is why I read blogs. I think that everyone has something unique and important to offer the world. I’m taking a class on teaching right now. The idea is that it’s for graduate students and postdocs who want to go into academia and be good instructors. It’s absolutely horrible. It’s a bunch of graduate students who want to be good teachers, who are voluntarily taking this class for no credit on our own time. The professor has all the right intentions, but he doesn’t really have a clue how to teach. We’re in a “flipped classroom” – this means that instead of doing homework based on class, we have class based on the homework. If you did the homework, class is less than useless, because it covers the first 1/3 of whatever reading you had to do. And the teacher, oh the teacher, his heart is in the right place, but it’s really just not very good. I’m the sort who always goes to class because I feel like I gain something out of it, even if only a tiny little bit. This class, though, I feel like it takes away, and that is incredibly frustrating. I promise, this all comes back to thinking differently and processing information. A couple of weeks ago, we were discussing Bloom’s Taxonomy (link is to wikipedia). For those of you unfamiliar with teaching pedagogy, it’s basically this idea that learning and teaching occur on different levels. To illustrate how Bloom’s Taxonomy works, the instructor had us all do a basic math quiz, and then discuss with our neighbors what level of Bloom’s Taxonomy each of the problems applied to. Then we had to share our answer with the group. Apparently, there was only one right answer. The instructor couldn’t fathom that some of us didn’t memorize multiplication tables, and that every time we were faced with a math problem, we had to think about it. And not only that, we thought about it in different ways. Thus, our location in the Taxonomy was different than where he thought we should be. To me, this is a great example of a diverse classroom and the need to be flexible in your teaching, to accommodate diverse learning styles. When multiple learning strategies are applied in the classroom, everybody benefits. But instead, the instructor spent 5 minutes discussing how my group (and another group who came to another answer) was wrong. I tried to explain to him how the problem worked for my brain, and he wouldn’t hear it, even when others jumped in and said similar things. The thing is, though, that this sort of questions about how someone processes information – they have no “right” answer. And that’s the beauty of humanity. Everyone thinks a little bit differently, processes information a little bit differently, and understands concepts a little bit differently. It shouldn’t matter what steps your brain takes to get from point A to point B. In fact, those steps will change and grow and mutate as you continue to process more information, to learn more, and build a framework about a subject. Being a good teacher hinges on understanding this fundamental difference in human cognition, both within an individual and among individuals. A while back, I wrote a post about how being autistic makes me a good teacher. Going through this class makes me realize that it’s not just the fact that I am autistic and therefore think differently. It’s the fact that I’m a metacognitive autistic who thinks about thinking, and who thinks about all of the implications of how my thoughts differ from other people’s thoughts. I think that this is the way to be a good teacher. And so, I continue to think, read, and write, about how people learn and process information. Maybe I am getting something out of this class after all. Hello, my dear readers, it has been a while, hasn’t it? I promise, this post has very little insightful about autism or my brain or anything. I just have been completely absent from the internet for a while, and am surfacing briefly to say hello, let you know that I’m still kicking, and say thanks for sticking with me. Hopefully more substantial things will be coming later. I’ll probably be writing a bit about my experiences of the past months, and what it’s like to be (not openly) autistic while trying to navigate the US medical system. I just haven’t found the words for that yet, especially since its still very much ongoing. For those of you who want more details, let me just say that I’ve been sick. Very sick. In and out of the emergency room and hospital. No one can figure out whats wrong with me. No one seems to want to talk to each other. I’ve been doing my absolute best to stay afloat and stay in grad school – that’s the source of my happiness, income, and health insurance, and while some kindhearted people have suggested I take a leave of absence, it is more likely to hurt than help. I love what I do, and it’s the one thing that gives me some purpose. My advisor has been extremely supportive and managing his expectations for what I’m able to do, and stopping grad school would leave me completely focused on “health”, which, at the moment, is rather depressing. It’s kind of my outlet in a way. I’ve been trying to manage a very interesting team of doctors, who won’t speak to each other at all except through abbreviated “visit notes” that go on my chart. No one has any answers, and they continually blame the problems on “well, it’s probably Doctor A’s specialty” to “well, I don’t know, it must be this doctor B’s territory”. It is ridiculous. One of my meds backfired and it took us nearly 2 months to figure out what was causing the problem. I’m *finally* starting to come out the other end, and maybe some of this will let up a bit. But as you might imagine, while I’ve been juggling all of this, writing, or really, doing *anything* beyond the research and work I’m currently paid to do, was out of the question. This is my first functional day in over 2 weeks. I should be working, but here I am instead. That’s one of the reasons this is short and purely information, not analysis. On a much happier note, about 2 months ago, I finally got out of my hell of a living situation, and am now living with an extremely wonderful person who I absolutely adore, who looks out for me, and genuinely cares about me as a person. Just that, alone, has done wonders for my mental, if not physical, health. And it’s really helped out when I have physical health flares, because I know there’s someone around if I need help. You might hear some from my new roommate on the blog at some point, too. And with that, I’m off to do some science-related things. Best to everyone – I’ve still been reading, and hopefully I’ll be back to contributing soon too. I’m not sure how I feel about this. Kind of amused, I think, because, well, I do think that whether someone likes me or not on “first glance” is kind of a pretty good judge of character. I think I’m a pretty benign sort of person. I’m pleasant. I go out of my way to be helpful and nice to people, but I’m also no-nonsense, especially when I’m teaching. And of course, I’m the first to admit, I’m a little bit peculiar. I move and dress and talk a little bit differently than most people. While I’m not openly autistic, it is pretty obvious that there is something a bit different about me. This means that most people who meet me once don’t quite know what to make of me. It’s those who take the time to get to know me before judging me that recognize my personhood and my kindness. Those who judge immediately and never think past it are the ones who dislike me. So to me, it is very interesting that my colleague has determined this pattern. I suppose it makes sense, and I think, in a strange sense, I’m flattered, because this colleague is a really thoughtful, mature person, and I respect his opinion quite a bit. And thinking about it, well, obviously I’m a biased judge, because I don’t like it when people dislike me without getting to know me first, so I tend to judge those people a little bit more harshly, it is kind of nice to know that other people recognize that I am a good person, and that those who don’t like me probably aren’t worth their while either. It is somewhat validating, to be quite honest. Has anyone else experienced this sort of thing? Also a note to my regular readers – this month started off strong, but unfortunately, between health issues and life issues (I’m moved!!!!!!!!! into a safe house, with a roommate who is utterly amazing, and let me tell you it is awesome), I haven’t been up to continuing the autism acceptance in action posts. Hopefully I’ll pull something together for the flash blog on April 30th. Hope everyone is surviving April better than I have. (It is getting so much better already, though.) I’ll probably write something about my awesome new roommate at some point, just not entirely sure when.